TEXARKANA — American Electric Power (NYSE: AEP) and its operating unit Southwestern Electric Power Co. (SWEPCO) announced today that the company has settled all legal actions brought against it by the Sierra Club, the National Audubon Society and Audubon Arkansas related to the John W. Turk Jr. Power Plant near Texarkana, Ark. 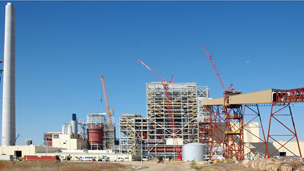 The John W. Turk Jr. Power Plant is shown under construction in October 2011. AEP and SWEPCO have resolved all legal actions brought against the plant by the Sierra Club, the National Audubon Society and Audubon Arkansas. The parties anticipate filing a consent decree today in U.S. District Court for the Western District of Arkansas in Texarkana. Upon approval of the consent decree by the court, subsequent filings to dismiss all other challenges will be made at other courts and regulatory bodies. The settlement resolves all issues raised by the groups’ combined or individual challenges to the Corps of Engineers Section 404 permit, the air and wastewater permits issued for the plant, as well as a complaint recently filed at the Arkansas Public Service Commission. The 600-megawatt coal-fueled plant, which is under construction in Hempstead County, is more than 80 percent complete and scheduled to begin commercial operation in late 2012. All legal challenges to any permits or certificates required to build and operate the Turk Plant will be withdrawn. The preliminary injunction in place in U.S. District Court will be lifted, allowing work to be completed on the plant’s water intake structure and transmission river crossings. AEP agrees not to construct any additional generating units at the Turk site. As long as the Turk Plant operates, AEP also will not build any new coal-fueled generating units at any location in Arkansas within 30 miles of the Turk Plant site. Once the Turk Plant begins commercial operation, the 528-megawatt Welsh Unit 2 near Pittsburg, Texas, will be limited to no more than 60 percent of its annual capacity. SWEPCO also will seek regulatory approval to retire Welsh Unit 2 no later than Dec. 31, 2014. The retirement date may be extended to no later than Dec. 30, 2016, if needed to complete transmission mitigation work related to the unit’s retirement, as identified and approved by the Southwest Power Pool. SWEPCO and its affiliates will construct or secure 400 megawatts of new renewable energy resources. Any new wind projects developed to satisfy the renewable energy resource commitment must meet U.S. Fish and Wildlife Service guidelines for minimizing impacts from wind development on birds and wildlife, and must be located outside of any Important Bird Areas — including the Mississippi flyway — identified by the National Audubon Society as of the date of this settlement. The Turk Plant will burn coal only from the Powder River Basin in Wyoming or sub-bituminous coal with similar sulfur characteristics. No future transmission lines associated with the Turk Plant will cross the Nacatoches Ravines Natural Area; the Little River Bois D’Arc Management area; property currently owned by The Nature Conservancy or the Arkansas Natural Heritage Commission within Hempstead County; property currently owned by the Hempstead County Hunting Club, which includes Grassy Lake area; or along the Kiamichi Railroad in Hempstead County. SWEPCO will test total annual particulate matter emissions from the plant to evaluate the potential for a lower emission rate; perform an additional analysis of wastewater discharge quality during the first year of operations; perform additional groundwater monitoring at designated intervals; and conduct baseline mercury sampling tests to assess conditions prior to operation of the Turk Plant. SWEPCO will contribute $8 million to The Nature Conservancy for land conservation in Arkansas. SWEPCO will contribute $2 million to the Arkansas Community Foundation, which will provide grants to support policy initiatives promoting clean energy resources and energy efficiency measures. SWEPCO will reimburse Sierra and Audubon for $2 million in attorneys’ fees and costs. As part of the settlement, the parties will make the appropriate filings to withdraw or dismiss all proceedings against the project, including the challenges to the U.S. Army Corps of Engineers Section 404 permit pending in U.S. District Court for the Western District of Arkansas in Texarkana; the appeal of the Arkansas Department of Environmental Quality air permit pending at the Arkansas Court of Appeals; the appeal of the ADEQ wastewater permit pending at the Arkansas Pollution Control and Ecology Commission; and a complaint regarding the lack of a Certificate of Environmental Compatibility and Public Need pending at the Arkansas Public Service Commission.